Convection is the movement of air or some other medium, initiating transfer of heat between two bodies of different temperatures. The grill methods uses one or more heaters directly heating the food. Convective transmission occurs between the external walls of the furnace and the environment, as well as between the interior walls and the work piece and the internal atmosphere. It has a greater significance at lower temperatures at which the heat transfer by radiation is less pronounced. At a temperature of 500 °C, the coefficient of heat transfer by radiation has ten times lesser value than at 1000 °C. In the case of convection, heat transfer takes place along the boundary of the solid body and the medium surrounding it. This kind of heat transfer occurs only if the medium is moving. The direction of heat movement depends on the temperature of the solid body and the fluid moving around that body. In many ovens, fans are used to provide a greater flow of gas over the work piece and the walls surrounding it. This case of convective heat transfer is modeled by the movement of the medium through a flat plate. Sometimes cooling of the furnace parts is done by circulating water through the cooling tubes. In this case, modeling is done by circulating the liquid through (most commonly) circular pipes. Natural (free) convection takes place due to the movement of the medium under the influence of the gravity force. During the heating of the medium (e.g. air), a spread and a decrease in density occurs. The warmer medium rises due to the lesser force of gravity that affects it. This kind of heat transfer occurs when the cooler air from the surrounding atmosphere contacts the heated outdoor furnace walls. Also, natural convection occurs between the interior walls and the gas inside the furnace. Electric furnaces are a typical example of natural heat transfer (convection) in a closed space. The heated gas conveys the heat by convection to a heated piece and on the walls. However, in such furnaces, there is a complex heat transfer, where besides the convection there is radiation. The transfer of heat by radiation occurs between heaters and the work piece, as well as heaters and walls. 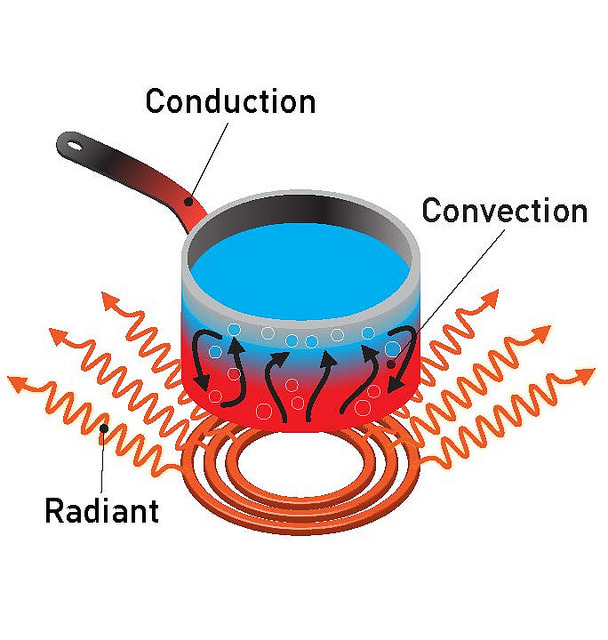 In a convection furnace, the heating elements are similar to the traditional one. The only difference is that the oven has a fan inside which circulates the hot air inside the chamber. By blowing this air, the food is cooked, and the heat is transferred faster. In traditional furnace ovens, the temperature inside the oven is raised by one or more heaters. After the air warms up, it rises above the top of the cooking space or chamber. The issue with the mechanism is that when the heat starts to get accumulated at the bottom, closer to the heater, or at the top, so the food gets uneven heating. Convection is the heat transfer process of air flowing through the interior of the oven. As a result, the temperature in the oven becomes homogeneous throughout the volume of the enclosed space and the hot air blows allow the product to be heated evenly from all sides. 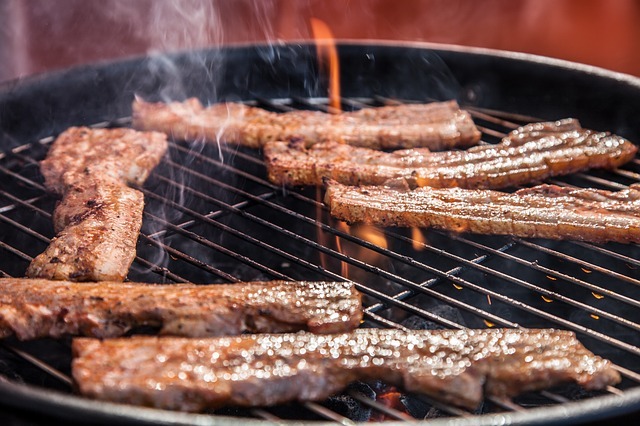 Grilling method is when a very hot, dry and direct heat is used to heat the air – usually the working piece is close to the source. Convection of air is a complex process when the warm and cold air stream change places, gradually mixing with each other and creating a whirlwind of hot air in the closed space. Typically air is mixed with the help of fans. The grilling uses dry heat to roast the working piece – it incorporates grill (tube that heats up). In case of convection the circulating hot air around the oven is not the only benefit, there are other advantages of the convection oven. The convection oven area helps to save a lot of time, money and energy when is properly used. It also eliminates the problem of uneven cooking. Advantages of grill oven are easier clean up, it provides more handy access, and cooking is typically faster. Disadvantages of convection method is that the temperature inside the oven may change dramatically when the door is opened and will affect the cooking time and results. Also the furnace walls get dirty quickly (self-cleaning technology is very useful in this manner). The main disadvantage of grill is the difficulty of regulating the heat transfer – so the food can be over or under cooked. Convection cooking is best used for baking, reheating, defrosting, and overall cooking. Grilling is best for roasting. Convection oven uses hot air that circulates through the space to heat up the food. The air is commonly transferred with the help of fans. Given that the convection oven prepares food by circulating the heated air through the oven, it can help remove the “hot spots” and the uneven cooking sometimes occurring in traditional ovens. Grills refer to the method of cooking incorporating heaters (tubes) that provides direct and very hot air to the working piece. It is best used for roasting. Emilija Angelovska. 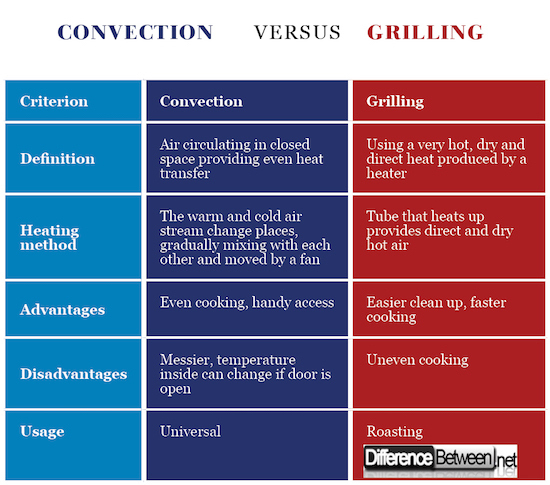 "Difference Between Convection and Grill." DifferenceBetween.net. April 5, 2018 < http://www.differencebetween.net/miscellaneous/difference-between-convection-and-grill/ >. Ojakangas, B., “Cooking with Convection Everything You Need to Know to Get the Most from Your Convection Oven”, Danvers: Clarkson Potter, 2009. Barham, P. “The Science of Cooking”, Berlin: Springer-Verlag, 2000.